A peaceful retreat, Crave Nail Spa was created using eco-friendly materials and offers clients a wide range of services using natural products. 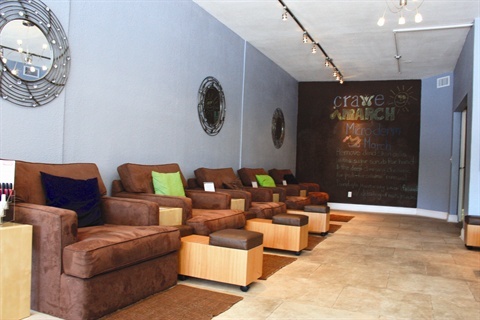 Located on one of South Tampa, Fla.’s trendiest streets, Crave Nail Spa is gaining momentum thanks to the comforting ambiance, natural ingredient-based services, and “walk-ins welcome” policy that have been implemented since day one. Owner Joezette Hite wanted to create a salon that incorporated relaxation, cleanliness, and high-quality natural-nail services without an inflated price tag. “Our concept was to be known as the walk-in nail spa, where appointments are not necessary,” Hite says. She chose Crave’s location based on its proximity to popular restaurants and shopping boutiques. “We are also located in an area where many families live,” she adds. After graduating from college, Hite spent eight years in the pharmaceutical industry as a sales representative in dermatology. She became inspired to research possible toxins and irritants in nail salons specifically after experiencing headaches during nail services while she was pregnant. “I knew smells could irritate pregnant women, but I wondered what it was exactly that was causing my senses to be so sensitive,” she says. Hite then came up with the idea of creating an “in-and-out” nail spa that was free of harsh chemicals and would provide chairs large enough to nurse a baby in or seat a child next to a client. After doing a great deal of research, she began planning for a year before starting development on the salon. In the winter of 2010, Hite’s expertise with dry skin conditions came in handy when the salon had its grand opening. “It was a great time to open because we were beginning our drier season and I had the opportunity to help our potential clients,” she says. Hite’s husband also played a role in helping Crave get off the ground as he not only helped come up with the salon’s name but also oversaw construction and supported Hite when she needed to rest. “When I would go home with the children, he would come in here and book appointments and show women to their seats,” she says. Described as a “modern earthy-feel,” Crave’s decor and branding hues were inspired by a cheerful bright blue and green headband that Hite happened to be wearing one day. “I presented it to my logo designer and she went from there,” she says. “We wanted to create a very earthy feel and a sense of calm when you walk into the spa. I think we achieved that,” Hite says. “Everyone says they feel very relaxed when they come in here.” Hite and her husband made great efforts to keep all of the design materials eco-friendly, including bamboo flooring, low-VOC (volatile organic compound) paint, and energy-efficient lighting. The salon features a separate lobby area in front and a spacious nail lounge area with two rows of large mani-pedi chairs, two manicure tables, and two esthetician rooms. One esthetician room is reserved for facials and wax services, while the other is dedicated to spray tanning and wax services as well. To keep everything as clean as possible, Crave nail techs wear gloves and use an autoclave to clean all implements. They use disposable buffers and nail files, and pedicure bowls with disposable liners instead of spa chairs. The salon’s furniture was also an important factor during the design process and tends to be one of the clients’ favorite features about the salon. Crave does not have televisions, but offers relaxing, ambient music that has been well received by clients. Products used for Crave services are as organic and natural as possible, according to Hite. The salon’s expansive service menu includes four types of natural manicures and pedicures, various facials, a full list of waxing services, airbrush tanning, and children’s Cutie Crave services. Despite being open less than a year, the salon is consistently booked for bridal, baby shower, birthday, and Cutie Crave parties every weekend. “Mani Mimosa Sundays” have also been a big hit with clients. Currently, about 90% of the business is focused on nails, with CND Shellac and Nail Harmony Gelish add-ons being clients’ favorite services. Crave also offers water-soluble Piggy Paints for children’s services and a variety of polish brands free of parabens, toluene, formaldehyde, and DBP for adults. In addition, Hite creates sugar scrubs from scratch and incorporates a variety of natural, essential oils into Crave’s private-label, paraben-free creams and whipped lotions. “I usually make the sugar scrubs in small batches and fortunately we are so busy that we go through the products without ever having to throw anything away,” she says. The salon offers three recipes for its popular sugar scrubs, which include ingredients like cocoa powder, almond oil, and Epsom salt. Most of Crave’s clients are professional women, ranging in age from 25 to 45. About 75%-80% of them are regulars, so the staff knows almost all of their clients by name. “Word of mouth is our biggest and best referral system. We also rely on social media and occasionally we advertise,” Hite says. Finding nail technicians has been Hite’s biggest challenge since opening Crave, she says. Many schools group nail technician training into esthetician certification programs, with a majority of students more interested in the esthetician track than nails. “Also, although we are a walk-in nail spa, on weekends it is hard to take walk-ins,” Hite adds. Many of the salon’s clients call ahead of time to book appointments on the weekends, leaving little opportunity for potentially new clients to experience the salon’s services. Hite also tries to get brand representatives to come train the staff when possible. One of the benefits of hiring nail techs right out of school has been that they’ve already been trained on newer techniques like Shellac and Gelish, she adds. Though retail only accounts for 1%-2% of gross profit, all of the products used during services are available for purchase. In addition to Crave private label products, the salon offers OPI, Zoya, Essie, Piggy Paints, Clarisonic, ilike, and Indigo Bee products.